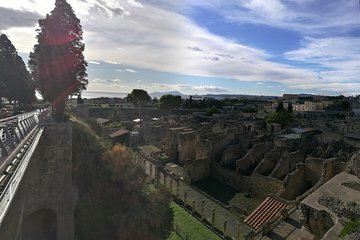 Explore the enigmatic ruins of ancient Herculaneum on a private full-day tour from Naples, then indulge in wine tasting at a local winery. Learn about life in ancient Rome as you roam the ruins of Pompeii’s lesser-known neighbour; admire the fine mosaics and skeletal remains; and discover how the city was destroyed in 79AD after the eruption of nearby Mount Vesuvius. Then, journey through the hillside vineyards, looking down over the Amalfi coast, and stop to enjoy an expert-led tasting of regional wines.